The lymphatic system is made up of glands, lymph nodes, and a network of vessels. The tonsils, spleen, thymus, and adenoids are the glands of the lymphatic system. This system plays three major roles in the body: Immunological defense, fat absorption, and fluid balance. If the lymphatic system isn't working properly, our bodies can't fight disease or remove toxins. For this reason it's crucial to keep the fluid of the lymphatic system (lymph) moving. Slow moving lymph can lead to disease, even cancer, in some cases. The heart pumps blood throughout the body in such a powerful manner that some fluid gets squeezed out via the capillaries. That fluid is known as extracellular fluid and is comprised of varying components such as proteins, water, glucose, electrolytes, enzymes, and hormones. When extracellular fluid enters the lymphatic vessels it's then called lymph. 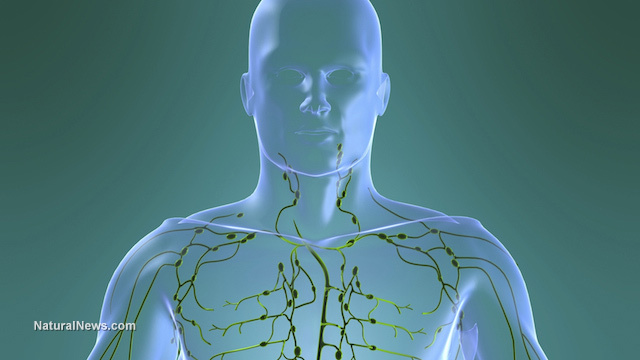 Lymph travels via the lymphatic vessels to the lymph nodes where it is filtered. Bacteria swept up by the lymphatic system is deposited to the nearest lymph node where specialized white blood cells, known as lymphocytes, destroy them. The increased number of lymphocytes fighting the infection will cause the lymph node to expand. Swollen lymph nodes are typically an indication of ongoing war between lymphocytes and pathogens. In rare cases, swollen nodes are caused by lymphatic cancer. Why is improving lymph flow important? Filtered lymph eventually returns to the blood. Unlike the heart to the circulatory system, the lymphatic system doesn't have a pump. Instead, lymph relies on smooth muscle and skeletal muscle to propel it through the vessels. This isn't very much movement so exercise is the best way to keep lymph moving. Lymph flow can decrease by as much as 94 percent in people with sedentary lifestyles. Stagnant lymph thickens until it becomes the consistency of cottage cheese. This prevents the lymph from being properly filtered; as a result, disease may manifest. The best way to improve lymph circulation is through movement. Running, jumping, walking, and stretching will help keep lymph fluid flowing. It doesn't take much effort; any of the aforementioned exercises performed for 15-20 minutes a day will help keep lymph flowing. If you can't get outside, stretching will also help. A quick 15-minute yoga session is a convenient, healthy, and relaxing way to start or end the day. Massage is also a great way to get lymph moving. Drink plenty of water to help your lymphatic system do its job properly. Lymph, blood, glandular secretions, and cerebrospinal fluid possess water as their primary ingredient. Water is used across the body for a variety of essential functions. Water holds nutrients in a solution while transporting them into our cells. Waste products from cells, the lymphatic system, blood, the bowels, and other body tissues are also held in a water solution while being transported to be eliminated from the body. Raw fruits and vegetables are rich in enzymes and acids which are powerful lymph cleansers. Specifically, beets, dark leafy greens, garlic, ginger, turmeric, cranberries, and citrus fruits are fantastic foods for cleansing the lymphatic system. Leafy greens are saturated with chlorophyll which help purify blood and lymph. Astragalus, chaparral, echinacea, ginger, goldenseal, lemon or yarrow can be made into tea to support lymphatic function. These foods improve circulation, fight infection, and help cleanse lymph. Click here to read more about the lymphatic system written by the author, Jeanette Padilla.